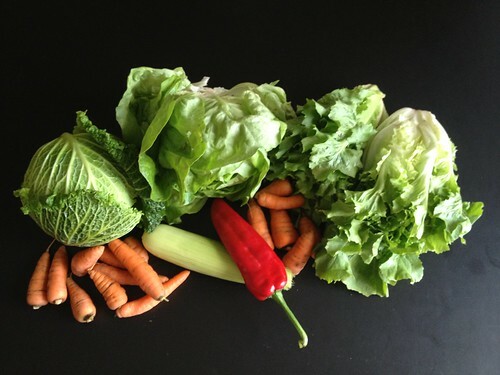 You are currently browsing the category archive for the ‘CSA vegetable loot’ category. I did some extra cleaning for the turn of the year, but that’s not what this post is about. 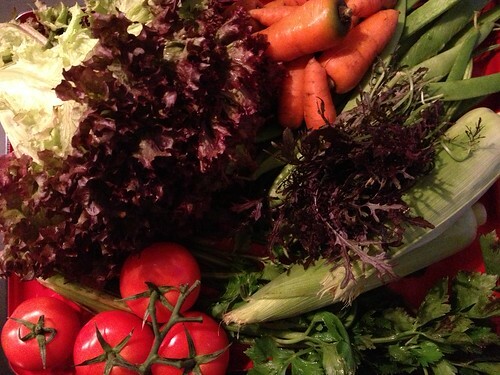 Maybe you noticed I haven’t been writing much lately; I even stopped (b)logging my weekly vegetable haul. Furthermore, I failed to make photos since December. O_o I guess I fell into some sort of winter slump. CSA season ended the week before Christmas but there are still many greens left in the fridge… Not that fresh any more. :\ So now that the new year has begun I’m resolved to take up menu planning again — and actually started a few days ago. The pantry and refrigerator need to be emptied of 2012’s remains! 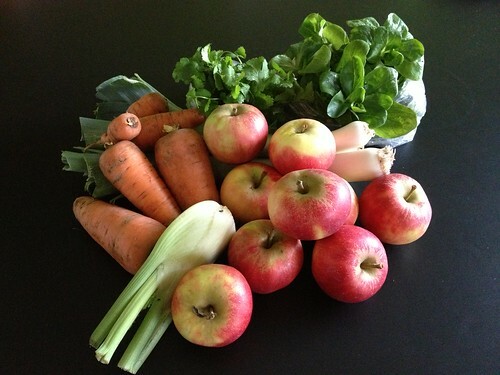 Once we’ve depleted this surplus we’ll get organic Odin vegetables till our local veggies return in May. Further planning will follow on Thursday. Now I’m hopping into the kitchen to cook dinner! So. VeganMoFo has ended and I didn’t meet my goal of 20+ posts… I got to 19! Not bad for a newbie, I think. Especially considering I’d planned to write some in advance but didn’t have the time. I also didn’t live up to the promises I made about travel-friendly recipes and how I survived my holiday in France as a vegan. Don’t worry, I still mean to make good on them! But now it’s back to normal with my weekly veggies and menu plan. Here’s this week’s fall haul. Including veggies we didn’t manage to eat up yet (green cabbage, fennel, leek, sweet dumpling pumpkins) the following will arrive on our dinner table. Wednesday: Nigel Slater’s peppers & chickpeas with harissa (adapted) with Sarah Kramer’s cumin spice quick bread (freezer stash) and fennel-tomato-olive salad with fresh basil (Groentegerechten p.32). Thursday: stuffed mini pumpkins with rice and gyro style roasted lemon olive seitan with dill sauce (Vegan Eats World p.54, 253); radicchio Caesar salad. Saturday: dinner @ my aunt’s! Sunday: kale-celeriac-potato mash with leftover veggie dogs & chorizo tempeh (VEW promo card), cabbage salad with coriander-mayo dressing left over from Sarah’s spiced potato salad. 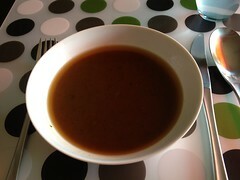 Monday/Tuesday: Nigel’s spicy stuffend pittas and soup (probably freezer stash or pantry). 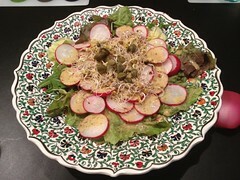 Wednesday (when @variomatic is joining us for dinner): Chloe Cascarelli’s pasta ‘Alfredo’ & salad. Possibles: apples from the oven with chocolate sauce (still have some left!) 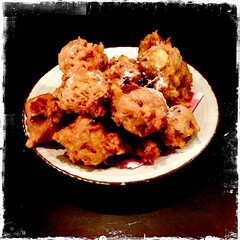 and Chloe’s cinnamon-espresso chocolate chip cookies..! My fridge is pretty full with open tins, leftovers and even more vegetables, so here’s my plan to use up as much as possible. 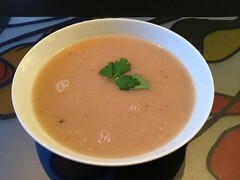 Leek & potato soup with cilantro (La Dolce Vegan! 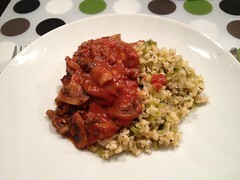 p.109), tasty tempeh chili for NVV-forum La Dolce Vegan! cookbook challenge (p.163) and bread. Potato salad with avocado pesto, balsamic vinegar, onion and sun-dried tomatoes, coconut-carrot soup with cilantro (La Dolce Vegan! p.112 half recipe). Fennel salad with tomato, basil and olives, roasted sweet dumpling pumpkins stuffed with Gyro seitan from my new Terry Hope Romero cookbook Vegan Eats World (p.54 & 253), leftover dill sauce. 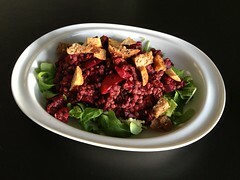 VeganMoFo Day 9 ~ What’s On The Menu? I had to play truant for a couple of days, but now I’m back at VeganMoFo with my traditional CSA (b)log post and menu plan. 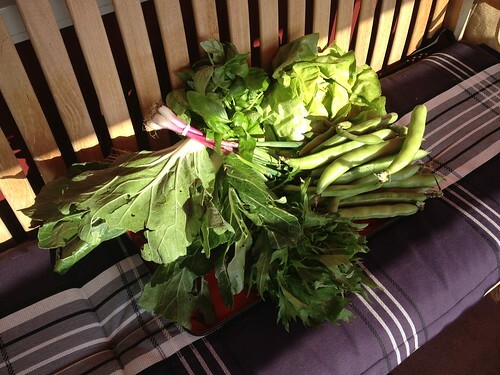 I still got last week’s runner beans and will be getting cauliflower and purple kale tomorrow from another local organic garden. So what’s up this week? Thursday: homemade tomato soup, leftover pasta with pesto, and leftover saag with chickpeas made into a pasta sauce with mushrooms, leek and baked onions. 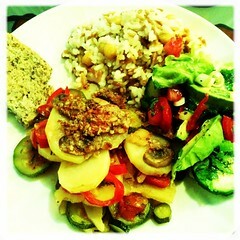 Friday: rice with chili (freezer stash), avocado, home-made salsa picante and steamed silver beet. Baking pumpkin crumb cake with pecan streusel from Veganomicon (p.255) for my friend Loes’ birthday. 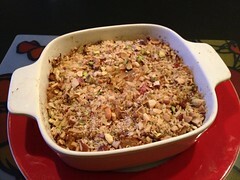 Will adapt the streusel to a nut mix as I don’t have enough pecans. Saturday: Turkish beans (taze fasulye), carrot-walnut salad with soygurt dressing (cevizli havuç salatasi) adapted from Lokanta cookbook and pide bread or a grain dish. Baked potatoes, veggiedogs and sautéed silverbeet with creamy cauliflower ‘queso’ from Cadry’s Kitchen. Quesadillas with leftover cauliflower ‘queso’; autumn salad with beetroot and baked pear/apple adapted from Baking Made Easy. 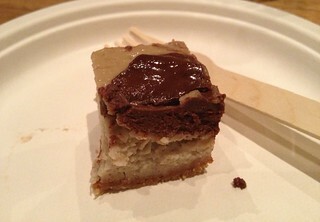 Dessert: sugared puff pastry with pear and chocolate syrup. Snack: kale chips (or this VeganMoFo spicy kale recipe from The Green Cuisine). 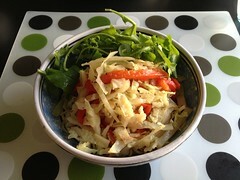 Sandwich spread: eggless salad with last week’s celery. Recipe recommendations really MUCH appreciated! Back to the present. 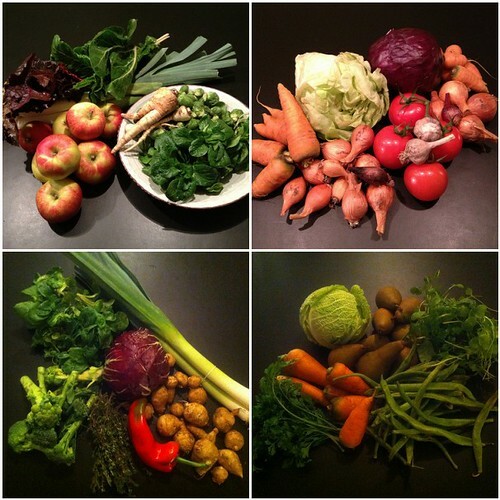 Here are the organic vegetables we scored in our CSA this week and the meals I plan to cook with it. I still had some carrots so they’re priority no.1! This is what I came up with. World cooking! Thai carrot soup, cumin bread (freezer stash) and salad. Indian saag (spinach), leftover dal tarka (lentils), basmati rice and papadums with chutney or soygurt-mint sauce. 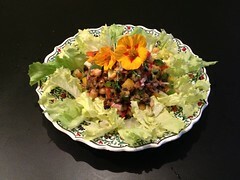 Turkish beans (taze fasulye), carrot-walnut salad with soygurt dressing (cevizli havuç salatasi) adapted from Lokanta cookbook and pide bread or a grain dish. Pasta avocado, peas and seaweed (instead of pickleweed) from Puur Plantaardig (p.82). I plan to make a dessert with some local pears that are ripe now — any suggestions? 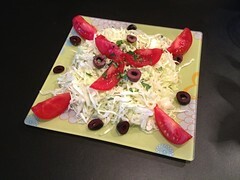 And with this week’s celery I finally hope to try my hand at some eggless salad.. Recipe recommendations much appreciated! So, what will YOU be eating tonight? Tonight I won’t be eating at home. I’m going to watch ‘Japalicious’ foodie films on the Camera Japan festival in Rotterdam: Eatrip (documentary) and Our Homeland (fiction). Alas, neither will be vegan but there is a Buddhist monk in the first one… And of course I won’t be eating animals today anyway! ;) On Saturday I’ll be going to the festival again, with Mr Gnoe and friends. Then we’ll be eating at a world restaurant, Bazar! Any eggless salad recipe you can recommend? Or a pear dessert? 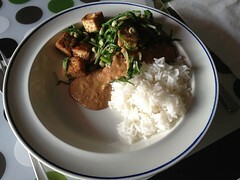 Last week’s menu is pimped with pictures, if you care to have a look. 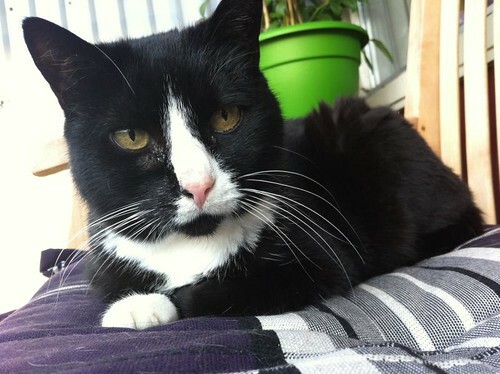 * According to the host of EetGeenDierenDag, Wakker Dier. I’ve got a busy week coming up with the start of VeganMoFo on October 1st. I haven’t been able to blog much lately and now I’m supposed to post daily and share the wonders of eating without animal products for a whole Vegan Month of Food! But more about that later. As usual I’ve planned my meals for the next few days so that I won’t have to think about that any more, nor run to the shops at the very last minute. Every little bit helps in finding time and peace to participate in the blogfest! 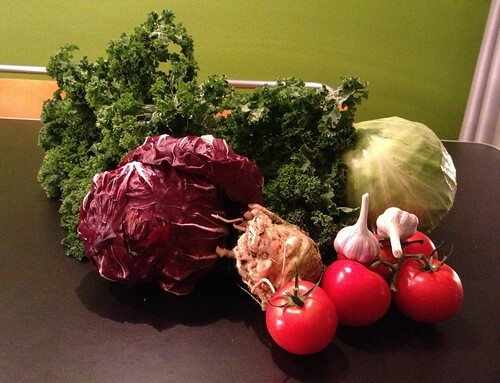 Now here’s our veggie haul. Other stuff in/around my fridge: carrots, chickpeas, roasted paprika, cauliflower, coconut milk, pumpkin & butternut squash, zucchini, cabbage, mushrooms, cilantro and some leftovers. Sometime during the week I also hope to make some roasted pepper houmous. I edited last week’s menu with photos of my meals. These are the veggies we got for the last week of summertime. 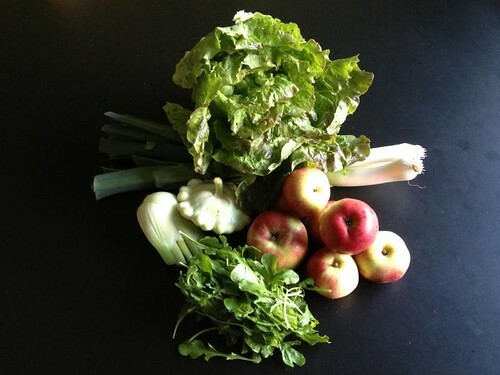 As we’re changing seasons today, these vegetables will be used in summer and fall menus. While planning our meals I got distracted by all the yummy recipes and forgot to include the escarole, even though I had marked it urgent on my list. :\ So I’m somehow trying to squeeze it in at the last minute. 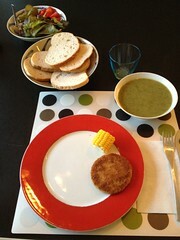 Freezer stash Friday: courgette soup, Fry’s chicken style burger on bread with vegetable toppings. 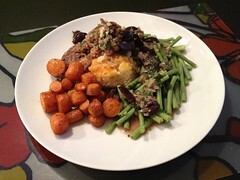 Saturday ~ from summer to fall: fresh tomato soup, seitan piccata with longbeans (p.174 V’con = Veganomicon) and oven-roasted sweetly spiced carrots with maple syrup (p.34 V’con). Postscript: I used all ingredients but pretty much messed about with the proportions of beans and seitan – still it turned out awesome! Sunday: red lentil – cauliflower curry with leftover roasted carrots for lack of parsnip (p.186 V’con), cumin spiced quick bread (p.267 La Dolce Vegan) for the Dutch vegan society forums cookalong and some extra simple veggies on the side, like braised escarole/cabbage, corn on the cob and/or escarole salad. Mediterranean Monday: Briami (p.56 A Vegan Taste of Greece), Turkish bulgar with chickpeas (freezer stash) and lemony cucumber salad. 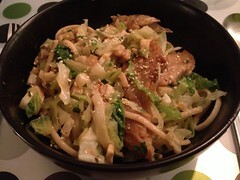 Asian Tuesday: cabbage ramen/noodles (double recipe) and teriyaki tofu with leek or (vegan) egg roll. 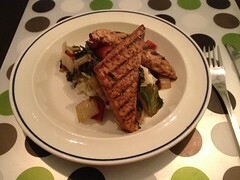 Maybe sautéed escarole with leftover smoky tempeh marinade. 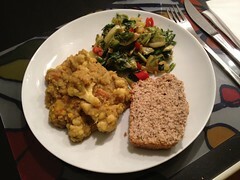 Wednesday: vegetable roti with tofu and chickpea salad (p.82 Vegan Taste of Greece) with raw escarole. Thursday: pesto pasta with Savoy cabbage (with pesto from a jar), Puy lentil salad with beet (and pine nuts, leftover smoky tempeh or bread garlic croutons instead of goat’s cheese). Lemon cupcakes were a favourite when I still ate dairy & eggs and I haven’t dared trying a vegan recipe yet… But this cake by Isa Chandra Moskowitz and Terry Hope Romero comes highly recommended! So will I find the time and courage this week?! BTW did I tell you I’m going to be present at Terry Hope Romero’s World Vegan Eats cookbook presentation and cooking demo in Amsterdam at the end of October? Looking forward to it! 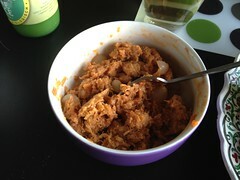 I updated last week’s menu with pictures from my meals, so have a look if you’re curious! It’s Monday, our holiday is over and things are back to normal. That means having more healthy meals at home and making my menu plans. Highly necessary because there’s a HUGE haul of veggies in the fridge. Here’s this week’s addition to it (apologies for the bad pic). 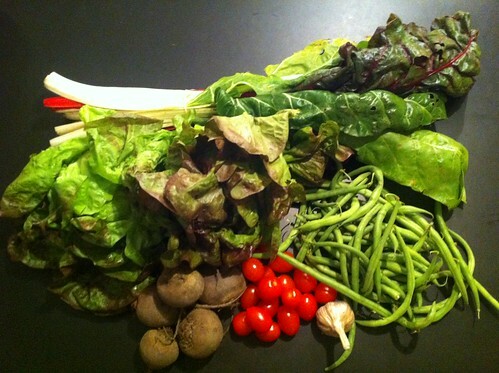 We still got lots of veggies left from last week, and from another type of CSA haul. From the top of my head: tomatoes, potatoes, corn on the cob, leek, fennel, radishes, sprouts, spring onion, spinach, white paprika, courgette, turnips, pumpkin, pointed cabbage, carrots, string beans. So let’s dig in and make a dent! 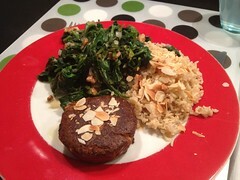 SUN ~ Saffron garlic rice (Veganomicon p.119) and Italian style sautéed spinach & tomatoes (p.106) with a tofu burger that’s a souvenir from France and radish salad with sprout greens and mustard dressing (inspired by Zonnig zomers tafelen p.21). 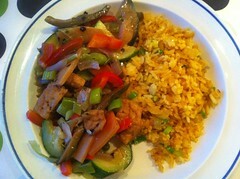 MON Indonesian ~ Nasi goreng and leftover tofu tausi takeaway (= black bean sauce) with some extra veggies added, simple cabbage salad (Feestmenu’s p.68) and emping. 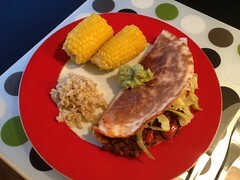 TUE Mexican ~ Chilli with tortillas and a little leftover rice, corn on the cob, guacamole and coleslaw with avocado (Groentegerechten p.58). 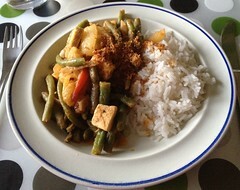 Change of plans: Indonesian ~ rice with sambal goreng boontjes á la Mr Gnoe. 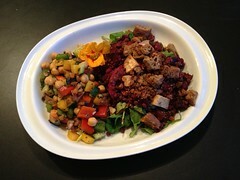 WED ~ Sautéed silverbeet (Veganomicon p.106) with smoky tempeh (p.130) on mashed potatoes and a sweet beet salad (Feestmenu’s p.68). Yesterday’s plan: Mexican ~ Chilli with tortillas and a little leftover rice, corn on the cob, guacamole and coleslaw with avocado (Groentegerechten p.58). 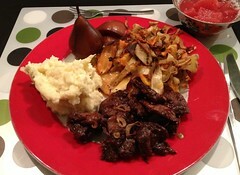 THU ~ Sautéed silverbeet (Veganomicon p.106) with smoky tempeh (p.130) on mashed potatoes and a sweet beet salad (Feestmenu’s p.68). I love the subtle colour combination of fresh greens, purple and white. 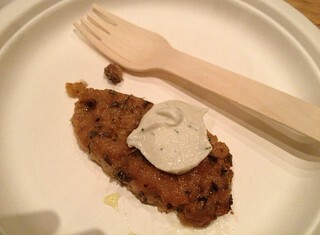 And here’s how it’ll look on the menu! 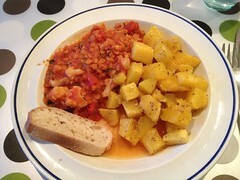 [Wednesday] Leftover night: courgette soup with baguette, lentil salad, broad beans, fennel beans with tomato-paprika sauce and cajun potatoes. [Thursday] Chilli with guacamole and rice. 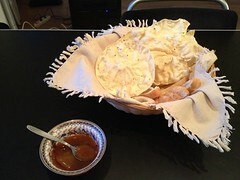 [Saturday or Sunday] Indian cuisine -to be decided- with leftover rhubarb chutney and papadums. 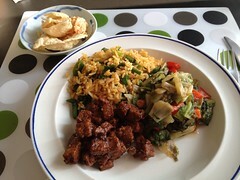 Sambal goreng boontjes & kool (cabbage & beans) with nasi goreng (fried rice). Spaghetti al (faux) ‘tonno’ with marrowfat peas. 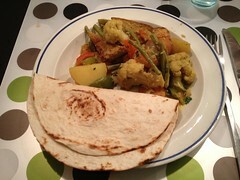 Veggie roti (potato, carrot, green beans, bell pepper, tofu). Most meals will be accompanied by salad. 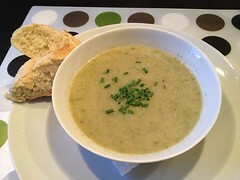 Also: courgette soup (again), EVA’s cucumber spread that Uniflame recommended, ‘tuna salad’, broad bean spread and I have yet to make those rhubarb-strawberry muffins! I didn’t feel like baking this morning. :( Maybe tomorrow?! 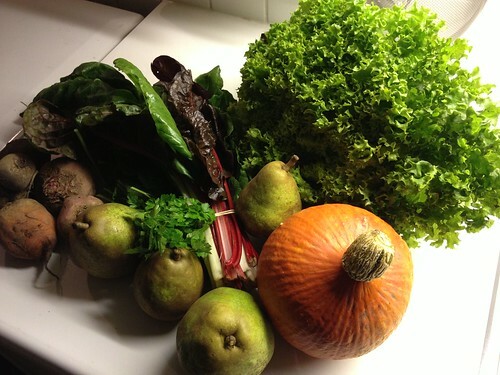 Another bunch of awesome greens to plan this week’s menu with! 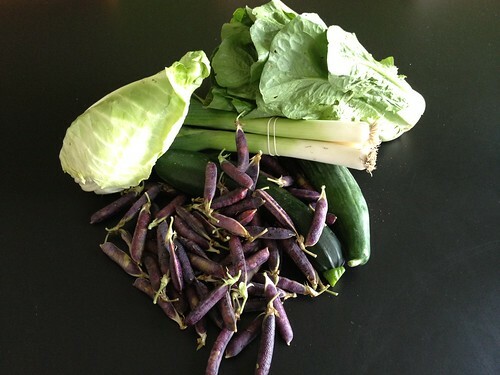 In addition I got some green beans, carrots, marrowfat peas, courgette and fennel from another organic farm nearby. [Wednesday] ‘Hokkaido pumpkin soup’: made up from kombu dashi & Japanse pumpkin out of the freezer, rice with Teresa’s garlic shoot stir-fry (La Dolce Vegan! 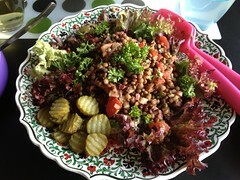 p.138), using mizuna instead of chard and marrowfat peas for sweet. [Thursday] Batavian endive ‘sajoer boontjes‘, nasi goreng, tempeh asem manis (Vegetarisch Indonesisch Kookboek p.116), emping. 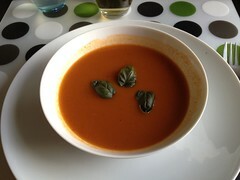 [Friday] Tomato soup, lentil salad (Bonenkookboek), bake-off baguette and faux tuna salad. 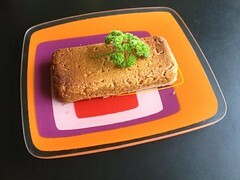 [Saturday] Tip-top tofu loaf for La Dolce Vegan! 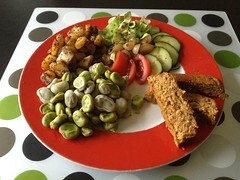 for cookalong on NVV forum (p.154), broad beans and cajun potatoes (Groot Vegetarisch Kookboek). Red berries and cherries for dessert. [Sunday] Fennel beans (Puur plantaardig), pasta marinara with fresh basil. [Monday] Thai carrot soup, pak choi stir-fry (Groentegerechten) with spring onions & marrowfat peas, spring rolls (freezer stash) & noodles. 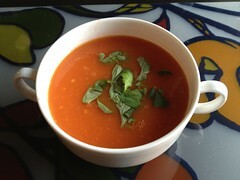 [Tuesday] Tomato soup, pasta zucchini cream wine sauce, salad.